In today’s article, I will explain you everything about: Buy X Get Y discount. In order to enable this discount, navigate to Marketing => Cart Price Rules. Enter the name of the Rule: Buy 3 t-shirts, get the 4th free. Select on which Websites you want to apply this rule. The Buy X Get Y doesn’t require a coupon, so select “No Coupon” in the corresponding field. You can limit the period of time for this discount or leave it blank to make unlimited. Also you can set the priority for the discount and define whether to make it public in RSS feed. Now open the Conditions tab. Click on the green point and select Product Attribute combination from the dropdown list. If ALL of these conditions are TRUE: If an item is FOUND in the cart with ALL of these conditions true. Select “Category” from the dropdown list. Define the categories for which you want to apply the discount. Click a table button to open the list of categories. Now the last but not the least section to be configured. Now push the “Save” button and let your customers enjoy the discount. 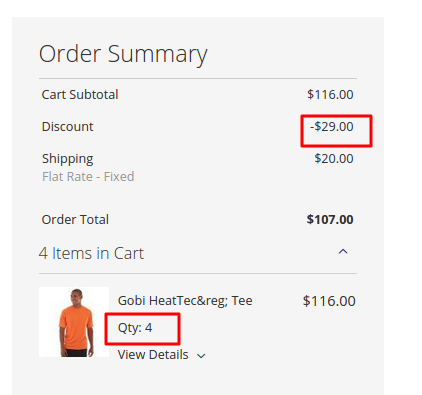 Now if a customer selects 4 T-Shirts, (s)he will only need to pay for 3 of them. This requires adding additional inscriptions on product page or special popups saying about the opportunity to get one T-Shirt for Free.